Creatine Gluconate is a fairly new form of creatine in which a molecule of creatine is bonded to gluconic acid, a molecule common in nature which comes about through the oxidation of glucose. Where Does Creatine Gluconate Come From? 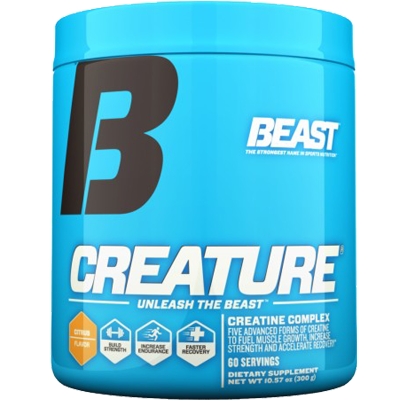 Creatine gluconate is made synthetically using creatine and gluconic acid. Gluconic acid is easily found in fruit, honey and wine, however the form used to create creatine gluconate is usually synthesized in the lab. Creatine gluconates proposed benefits are that it is more soluble than regular creatine monohydrate thanks to the higher solubility of gluconic acid. Creatine monohydrate is notoriously hard to mix in water, often leaving a sandy texture which can be unpleasant, especially during the loading phase in which you need to have it 4 times a day. Increase solubility not only improves the palatability, but can also support improved absorption into the muscles. Being derived from glucose, gluconic acid also helps to improve the absorption of creatine into the muscles thanks to the fact that intestinal absorption is similar to that of regular glucose. Creatine is one of the most well studied and proven ergogenic (performance enhancing) ingredients. It is well known to support strength and power performance, gains in lean muscle mass and high intensity exercise performance. If creatine gluconate is in fact absorbed faster and is more bioavailable than regular creatine monohydrate, then it could definitely provide similar benefits but with a lower dose – thereby cancelling out common side effects of creatine monohydrate use. There are currently no studies on the safety or any side effects of creatine gluconate use. Creatine and gluconates individually are safe to use with gluconate compounds often being utilised as intramuscular injections. As long as you’re sticking to under 20g per day, you’d be more than safe taking this novel form of creatine. There are currently no recommended guidelines for creatine gluconate use, however, following typical creatine loading guidelines should offer similar results. These guidelines include 20g per day for 5 days in four divided doses of 5g each followed by 5g per day thereafter. However, as the ingredient is much more easily absorbed, perhaps not as much is required. 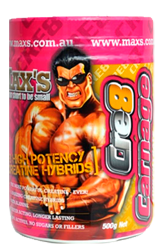 Creatine Gluconate is a fairly novel ingredient, however you could find creatine gluconate as part of a larger blend of creatines in supplements such as Max’s Cre8 Carnage and Beast Sports Creature. Creatine Gluconate can essentially be stacked with any other supplement such as protein supplements, intra-workouts and especially carbohydrates, but should not be paired with supplements with excessive caffeine such as fat burners and high stimulant pre-workouts as it can reduce its positive effects.